Reporting can be an important part of your work. It might take a month of Sundays to efficiently customize report delivery. What if there are several recipients you have to show the results of your work to? What if they all have special timing requirements? Just in case everybody wants to know how popular and often discussed your brand is becoming, this new update is for you. 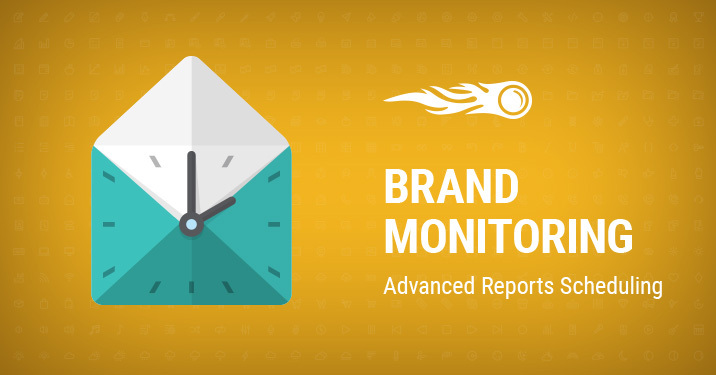 We have enhanced the mailing system in the Brand Monitoring tool in order to diversify possible workflows. Previously you could set up BM mailing once a week for the address linked to your account. Now you're able to send three different reports to three recipients daily, weekly or monthly, and also select the exact time, day of the week or date. Let’s say your boss wants to receive BM reports once a month, the marketing department every Tuesday at 1.00 pm, and you every day. Easy as pie! Find email scheduling options in Settings. How do you find this update? Isn't it an amazing one? Too many questions? Feel free to ask yours, and also share your ideas and suggestions by emailing us at [email protected]. More news ahead!